Flat roofing comes with its own particular set of problems and methods of repair. 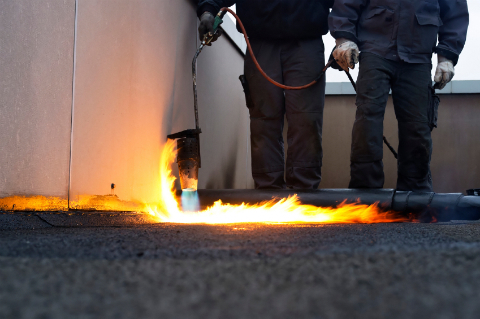 Here are the top three mistakes when it comes to flat roof repair. It is important to regularly inspect your flat roof. Small leaks will quickly turn into big leaks if left to their own devices. Every small crack or bubble indicates leakage. Do not wait until the problem becomes so big that you have to replace your entire flat roof. Do not think you can simply spread roofing cement over a crack, or cut open a bubble and paste on some more roofing material. This can actually make the problem worse, and may not be dealing with the root of the problem. If your hired contractor takes one look at your flat roof, and recommends a band aid solution, find another contractor. There are many tutorials and videos online on how to perform flat roof repair. A quick YouTube search might make you think that it's as easy as screwing in a light bulb. However, flat roof repair is not as simple as some advise. Finding the source of leaks on a flat roof is a difficult task. Water can travel many feet from a defect in one layer to a defect in another. Only qualified roofers know how to diagnose and properly repair flat roofing leaks. They can also inspect the entire structure to determine the health of your flat roof. If you are experiencing an inordinate amount of leakage, it is possible that the whole design of your flat roof is faulty, and could need a total upheaval in order to save you time and money on costly water damage repair. If you make any of the mistakes described above, you may end up having to deal with rodent infestations, structural damage to your home, toxic mould growth, and in the worst case scenario, having your entire roof collapse. A leaky roof can also be a serious fire hazard. Consider that your roof is the first line of defense against the elements, and if it is not performing it's duty of keeping the weather out of your home, you might as well not have a roof at all. Use HomeAdvancement to contact qualified roofers in your area. Up to five contractors will contact you to provide you with free quotes on your flat roof repair job.